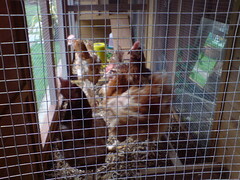 My ex-battery hens, the first days. 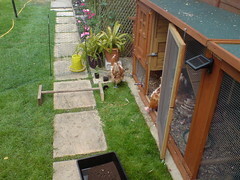 Okay, so I thought for this post, I would find some pictures of our hens on their very first days out in the world!! As mentioned in previous posts, we have 8 gorgeous ex-battery hens from the BHWT (British Hen Welfare Trust). I’ll keep mentioning them too because they are amazing. They’ve rescued over 200,000 hens to date, from what would have been death…. these birds are only about 18 months old when they’re considered ‘spent’ and this is a tragedy. Awareness is growing, but there is still a long way to go…. Anyway, back to my girls!!! Here they all are in their shiny new home. I showed this picture on an earlier blog post, but I think it catches them perfectly! 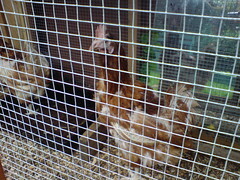 The hens need to stay in for the first few days to minimise stress, but ours were keen to explore. This is Crispy on her first day. Look how pale the face is, how many feathers are missing. These ladies have quite few feathers compared to some girls that have just come out, but it’s heartbreaking to think that there are millions (approx 16 million in this country) of hens kept in battery farms. How is this legal and how can anyone think it’s right?? Here is Chicken 11 on her first day. 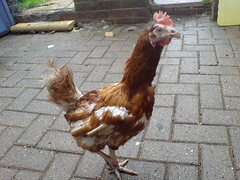 She looks a bit like a road runner here, due to her lack of feathers!! She was the strangest looking, as her comb was very large and floppy! It covered one of her eyes to start with, she looked everso funny! She had bald bits, and was the worst condition out of the original 4 hens we had. This is the second day. We filled a large garden tray with some soil to give them something interesting to do. They started to scratch about in it and even tried to dust bathe in it!! We opened the run door and watched. It was amazing to see these poor, scraggly birds, slowly perk up and explore. Every moment that went by was something new for them and of course for us! We’d not had hens before, but I’d always wanted some. The first steps outside!! Mel was the first one to take the big step! She was called Mel after Mel Gibson in Braveheart! We made a small temporary pen area out of chicken wire and posts, just to give them a boundary. Hens are actually very good jumpers and can propell themselves with their wings! This pen would not hold them now, but when they first come out of the farm, they are weak and don’t know what they’re capable of!! This was their first steps on grass too! Amazing! Slowly but surely the other girls emerge from the safety of the pen. 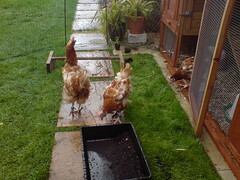 This was only their second day with us, but they were keen to get out and about, so we let them. You can see in this photo the curious nature of the birds. It was raining too, another thing they had never experienced! Chicken 11 was still inside at this point. Here you can see Crispy, Mel and Terri taking it all in! Chicken 11 hangs back from the others. She was the weakest and the shyest bird right from the beginning. She had huge feet, a huge floppy comb and always looked terrified of life! But she had the prettiest face and the sweetest disposition of them all. The morning of day 3! All of the girls were keen to come outside and explore! The sun was shining, the grass was wet and all the girls survived the night. 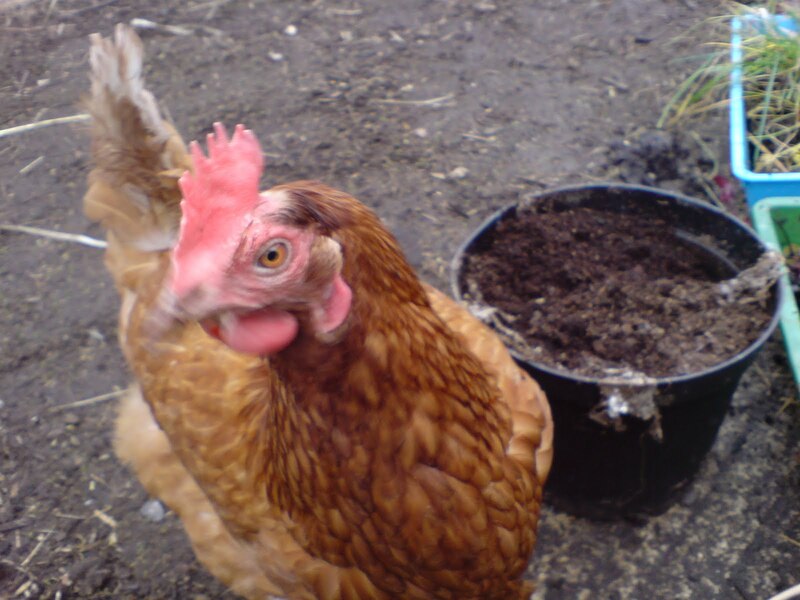 I put some mixed corn down, just to see what they would do, but it takes a little while for hens to recognise anything but hen food as edible…. They were only fed Ex-battery crumbs at this point, as it’s the closet thing to what they would’ve eaten in the farm. Enjoying the sun!! The sun comes out and the feathers start to lift! 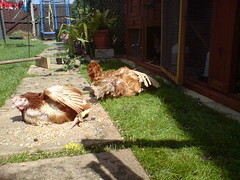 Hens love to sunbathe, these girls will have never felt the sun on their backs before and I think this photo shows exactly what they’re thinking! Bliss!! Chicken 11 is the first to hit the deck for a sun bathe! 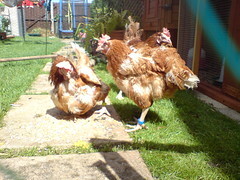 Mel is stood in the front (blue leg ring) with her feathers all ruffled to allow the sun to penetrate to her skin. Finally, they’re doing hen things! It’s amazing how quickly they adapt to their new environment. I believe, although sadly, that it’s this adaptability that allows them to survive in the harsh conditions of the battery farm. 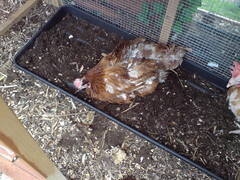 Day 4, Crispy takes her first dirt bath! This is another popular hen activity! 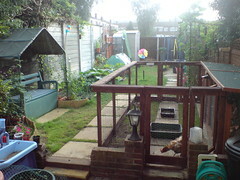 We provided the girls with a large garden tray filled with compost and a large cat litter tray, also filled with compost. A fun game is to mix meal worms into the compost, they go mad!! Meal worms are the top snack for my girls, but they are also very expensive! This is about a week after we got these lovely ladies. You can see how un-phased they are by anything!! Here is my son with his wheel barrow, ‘helping’ in the garden…. this involved pushing the wheelbarrow at high speed with engine noises…. the hens weren’t bothered at all…. 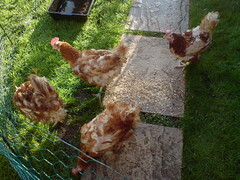 You can see how much brighter the hens look already, amazing! 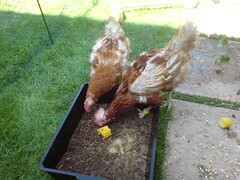 Chicken 11 and Terri ‘attacking’ the corn cob…. they’ve decided it’s edible and not evil and eat it very enthusiastically! 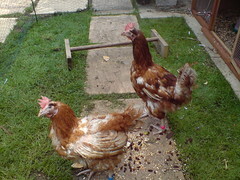 Here are Crispy and Mel about a week after we got them…. you can see already, that their combs are starting to redden and they look very much at home! 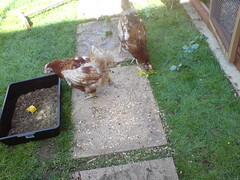 The bits on the floor are mixed corn and sultanas, although they still haven’t worked out that they can eat them yet! My husband made a perch for them for outside, so far, they weren’t too interested, but it takes time. 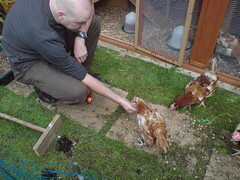 Here is my husband feeding Mel by hand. 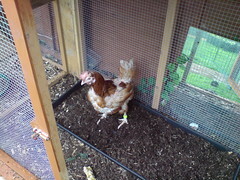 Mel has always been the bravest and most people friendly hen. I think she secretly wants to be a cat, even now she tries to sneak in the house…. This is amazing really, considering how people would have treated them up till now…. they really are wonderful creatures. Crispy out of the pen! Just over a week at their new home and the girls have shown real interest in the rest of the garden! We decide to open the pen and see if they want to roam! Here is Crispy on the patio, you can see her straining her neck to get a closer look at everything. The tail is up and she’s fully stretched out! What a beauty! My husband makes a permanent pen for the girls. This gives them their own space and gives our cats a break too!!! The gates are open (both ends) during the day when we’re home, but they stay in here if the weather is really bad, or we go out for the day. Although they have a huge run, they feel a bit hard done by if they have to stay in, so this is a compromise! Terri meets one of our cats, Spice. Spice is fairly indifferent to the hens, and even now, she shows respect and stays out of their way, but doesn’t run, unlike the two male cats we have. 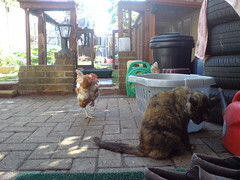 The hens will chase the male cats, but seem to leave Spice alone. You can see Terri sizing Spice up here…. looks like trouble! Mealworms!!! 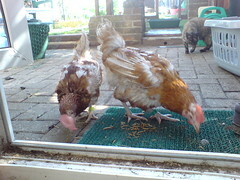 As previously mentioned, meal worms are the favorite treat of my hens (and any hen I would think!!). We have given them dried and live. They show no preference between the two! 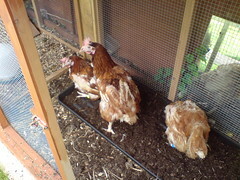 The worms are always met with exciting noises and the hens will jump on top of each other to get to them. It’s very funny to see them get so over excited about food!! Crispy in the flower bed. Now, when you have hens, unless you are willing to put fences up everywhere of have space to give them their own garden, having a flowerbed is near impossible. 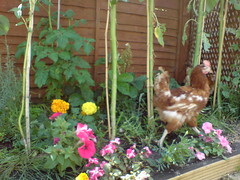 This was my flowerbed before hens….. now, only the lavender and sunflowers survive!! I have a gooseberry bush now which seems to be alive still, but I’ve yet to have a chance to eat any of the gooseberries!! Cheeky minxes! I’ll finish there for now, but I’ll do another few posts with some more photos of our girls. If you’re thinking of getting hens, I can’t recommend it enough, they are intelligent (but do stupid things sometimes), hilarious, friendly, affectionate and brilliant pets for children. The ex-battery hens are so rewarding. You rescue these pathetic looking birds, and can watch them blossom in your care. A year down the road for us, and these birds look completely different! Crispy nowadays, look at the difference! 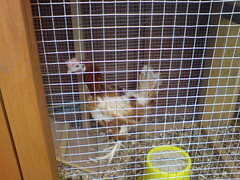 She has all of her feathers, a bright red face and comb and she’s a normal, albeit cheeky, hen! She loves nothing more than digging in the dirt, finding worms, begging for treats (banging on the catflap till I notice and give them something) and she loves human company! If you’re thinking about getting hens, do it….. do it now!!! Here is Mel giving us a ‘hint’ that she maybe ready to leave the pen….. subtle is not her middle name!! Thanks for reading, I hope you find this interesting. I love my hens and I love sharing them with everyone. I love to be active! I love to spend time with my son and husband. I'm self-employed and work whilst my son is at school and weekends when my husband is home. I enjoy drawing but don't have much time for it at the moment. I also enjoy cooking, baking and gardening. I'm on Twitter @pinwingirl if you want to find out more. 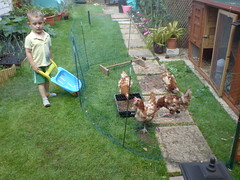 This entry was posted in Chickens, Hens and tagged back garden, back garden hens, cages, chickens, ex-battery hens. Bookmark the permalink.